This goes out to all those "man cavers" out there. 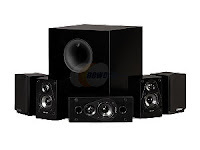 Today Newegg.com is taking half-off this Energy Take Classic 5.1 5.1CH Premium Home Theater System and tossing in FREE shipping too! "Finished in high-gloss black, this six piece bundle features four satellites, a center channel and a subwoofer for convenient surround sound. These compact speakers fit almost anywhere, letting you decide where and how you place your system." I wonder if I can hook it up to my laptop.